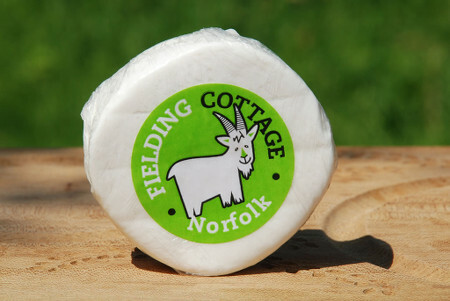 Ellingham Goat’s Cheese is created by Sam Steggles and his family in Norfolk, and sold under the business name of Fielding Cottage (named after their home before moving to Honingham, as the business expanded). Sam and his wife decided to embrace goat herding as a means of differentiating themselves from other Norfolk farmers and now produce high quality Goats milk, cheeses and meat, for which they have been highly commended in the Norfolk food and drinks awards. Their first ten goats were bought from Cumbria in 2009, and since then they have purpose built a cheeseroom, expanded buildings from which to sell their Goat’s products, now including skincare ranges, and expanded the herd to include Alpine, Toggenburg and Saanen goats, now numbering around 100. The pull of creating and selling the Goats cheeses, of which Ellingham was the first, Sam says is “engaging with the customers, and with the wider community” as most of his sales are through local shops, farmers markets and to some high class restaurants. As a young farmer, actively involved in the Young Farmers Association, he has also embraced new ideas to attract the public including effective and engaging use of social media, creating the Fielding Cottage experience in which you can visit the farm and milk the goats, and a sponsor a goat programme. Ellingham Goat’s cheese is very similar to feta, being fresh, soft and white. The texture is particularly crumbly. Very moreish! Great as a Goat’s cheese addition to a cheese board, and lovely on its own with bread or crackers, this cheese is also ideal for use in salads. If you’re feeling overtly adventurous, you could also try (if you’re brave) Fielding Cottages own recipe for…wait for it…Goat’s Cheese Chocolate Truffles. We were chicken, so if you click through and try this receipe let us know what you thought!